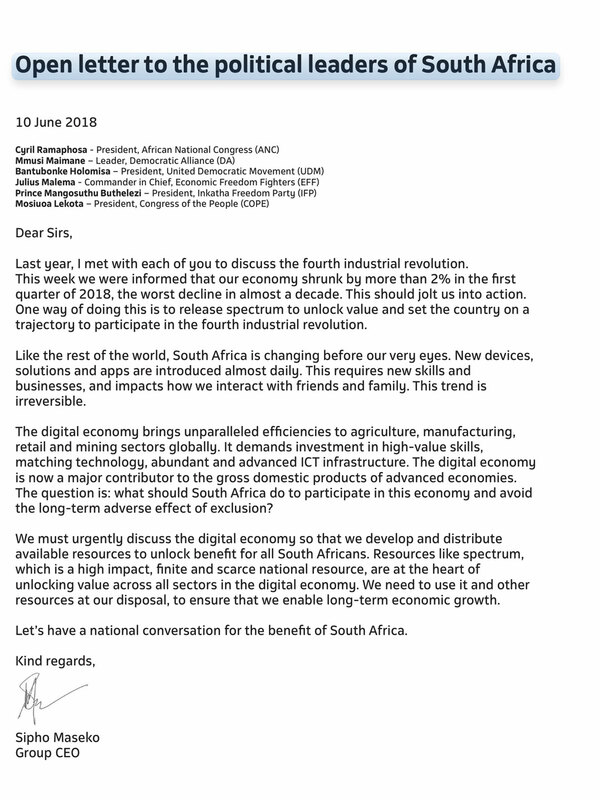 In a full-page, paid-for open letter in the Sunday Times, addressed to “the political leaders of South Africa”, Telkom CEO Sipho Maseko implored the politicians to have a national conversation about the importance of ICT infrastructure investment in growing the economy. 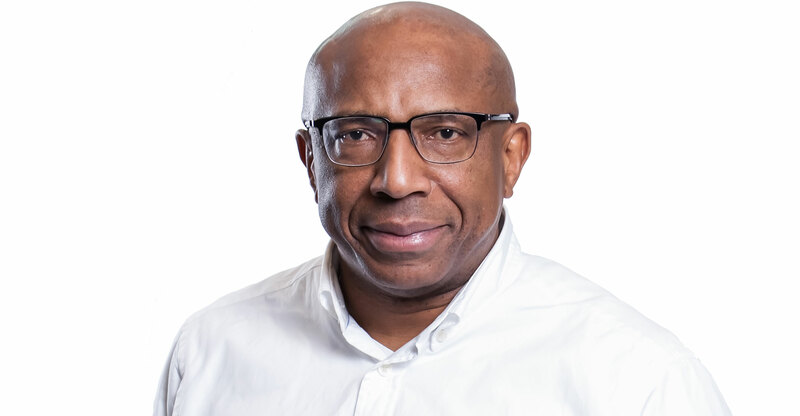 Bemoaning the 2.2% slide in GDP in the first quarter of 2018, the Telkom CEO said the weak economic numbers should “jolt us into action”. He’s right, of course. Government bungling has meant South Africa has still not allocated spectrum suitable for building 4G networks, never mind next-generation 5G technology. Operators have had to reallocate their 2G and 3G spectrum assignments to offer 4G services. They are fast running out of spectrum, though, and their ability to continue to expand their infrastructure is now constrained, especially in urban areas where demand is highest. And the seemingly never-ending delay in South Africa’s digital television migration project has meant that spectrum in the so-called “digital dividend” bands — at 700MHz and 800MHz — is still being used to deliver antiquated analogue TV signals instead of being reallocated for mobile broadband. This directly affects consumers in underserviced areas. But Maseko’s letter also needs to be taken with a pinch of salt. This is because it was Telkom that in March argued that government’s planned wholesale open-access network (Woan) should be given all unassigned “high-demand spectrum” — the radio waves that can be used to build speedier 4G networks. If that proposal were to be implemented, South Africa would likely end up with a new infrastructure monopoly that would hobble competition and innovation, harm the industry and lead to more expensive services for end users. I’ve written previously in this column that the Telkom presentation — led by Alphonzo Samuels, the CEO of its wholesale arm Openserve — to officials of the department of telecommunications & postal services would lead to a bad outcome if the proposals it contained were implemented. The company advocated that Vodacom and MTN — and others — shouldn’t get access to additional spectrum. That doesn’t make much sense — except, perhaps, for Telkom, which wants to hitch a ride on its competitors’ coattails through a monopoly Woan. I wrote that Telkom is, in effect, attempting to drag down the rest of the industry by denying its rivals access to exclusive-use spectrum, their lifeblood. This is not in the best interests of the industry or of consumers. South Africa does not deserve or need another monopoly. We don’t want the 1990s back. Maseko has not backed away from the position that Telkom took when it presented its views to government in March. One must therefore assume a monopoly or dominant Woan remains the company’s preference. While it’s to be welcomed that Maseko is raising the constraints facing the industry in a public forum — more pressure needs to be applied on government to get on with the process of licensing spectrum given the obvious attendant economic benefits — it’s hoped that political decision makers don’t take the company’s specific proposals too seriously.